I will go through my Mac installation but if you are using another OS, you can find the installation instructions for SciPy on: http://www.scipy.org/install.html. You should have Python 2.7. I am using a Mac on OS X 10.8.5 and used MacPorts to setup the SciPy stack on my machine. Run the following in terminal to select package versions. IPython allows you to create interactive python notebooks in your browser. We will get started by creating a simple hello world notebook. Create a new directory where you want your notebooks to be placed in. This should open your browser to the IPython notebook web interface. If it does not open, point your browser to http://localhost:8888. This should open a new tab with a newly create notebook. Click Untitled at the top, rename the notebook to Hello World and press OK. Suppose we are doing a study on a wheat farm to determine how much of each kind of wheat is in the field. We collect a random sample of seeds from the field and measure different attributes such as area, perimeter, length, width, etc. Using this attributes we can use k-means clustering to classify seeds into different types and determine the percentage of each type. 7. length of kernel groove. Download the file into the same folder as your notebook. Create a new notebook and name it whatever you want. We can put all the code into one cell. First, we need to parse the data so that we can run k-means on it. We open the file using a csv reader and convert each cell to a float. We will skip rows that contain missing data. Next, we normalize the features for the k means algorithm. 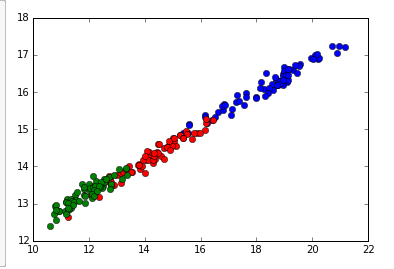 Since Scipy implements the k means clustering algorithm for us, all the hard work is done. Finally, we can graph the classifications of the data points by the first two features. There are seven features total, but it would be hard to visualize. You can graph by other features for similar visualizations. Note: to show the plot inline in the cell, we put ‘%matplotlib inline’ at the beginning of the cell.